I have heard many Twins fans complain about the front office and their drafting ability. I looked more into these drafts and decided I would do an article reviewing the last ten first rounders. The front office doesn’t get enough credit for the players that have been drafted. I would say most twins fans would know 8/10 of those players. Alex Wimmers and Levi Michael are the players that didn’t work out for the Twins. Let’s briefly go through each player by how I would rank them. 10.) Levi Michael: After being drafted by the Twins in the first round, Michael has spent seven seasons in the minors, never seeing major league action. He is now with the San Francisco Giants at age 27. 9.) Alex Wimmers: The only reason Wimmers is ahead of Michael is because he has reached the majors. He played for the twins at age 27/28 and threw 24.2 innings with an ERA of 4.38 and a WHIP of 1.662. He last played in 2017 and is a free agent today. 8.) Tyler Jay: Jay is a pitcher who started out as a starter but has now basically converted completely to a reliever. He has not had the success the twins hoped for quite yet. In his four years in the minors he has not reached AAA. His last two seasons have been the most disappointing. In 2017 he missed all but 11.2 innings and in 2018 he had a WHIP of 1.575. He will likely get a chance to pitch for the Twins in September. 7.) Nick Gordon: After being in the top 100 prospects from 2015-2018, Gordon has dropped out of there after a season where he hit .212 with an OPS of .544 and striking out 21% of the time in AA. He just wasn’t ready for that AAA league and may start the 2019 season back in AA. I would love to see Gordon perform well enough to be called up in 2019 but it’s more likely we see him in 2020. He is still young at only 23 years old. 6.) Trevor Larnach: I’m only ranking him 6th because we’ve only seen him play in half of 2018. He showed that he could handle the A level of the minors, hitting .297 with an .878 OPS and limiting his strikeouts. He will probably start in the A level again but could potentially move to AA soon if everything goes right. 5.) Kohl Stewart: I am really high on Kohl Stewart, the 24 year old showed he was capable of pitching to major league hitters in 36 innings lasts season. Unless the Twins go sign another starting pitcher, Stewart will have a good chance to pitch 100+ innings this season. He has to learn to limit the walks (4.4 BB/9) which is something he was able to do in the minors. If he can reach the K/BB of 3.06 he had in the minors then he could reach that next level of success. 4.) Kyle Gibson: The most inconsistent pitcher who has managed to stay on the Twins team since 2009 has finally reached his potential it seems. He holds a career 4.47 ERA but in 2018 he has a 3.62, and his WHIP was at 1.302 which could still be lowered. If he reduces the WHIP he could be even better for a twins team that will need him in 2019. 3.) Byron Buxton: We have seen the potential that Buxton has, and it’s amazing. He can be the fastest runner in baseball, the best fielder and now all he has to do is become at least an average hitter. His running and fielding skills are so elite that he received MVP votes in 2017 with a .253 AVG and .728 OPS. He missed most of 2018 with injury issues but if we see a .270 hitting healthy buxton then we will be hearing his name in MVP conversations again. 2.) Alex Kirilloff: It’s looking like the twins scored big with their number 15 pick just a few seasons ago. He is ranked in the top 10 prospects by MLB and is coming off of a monster year just one season after a TJ surgery. He his .348 with a .970 OPS in the minors and has been invited to spend the 2019 Spring Training with the Twins. 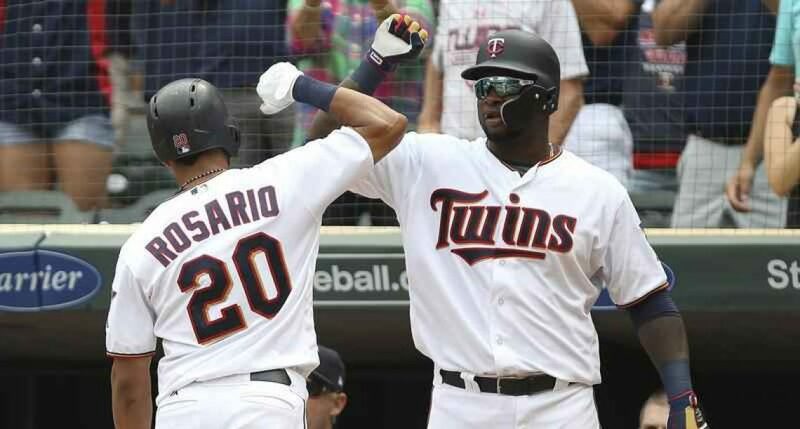 If he performs like that again we may see the outfielder playing for the Twins in September. Expect him to spend most of the season crushing AA pitching. 1.) Royce Lewis: Finally at number one is the former number one overall pick, Royce Lewis. The shortstop cane into his first full season and hit for a .292 AVG and a .803 OPS. The speed is a great tool for him, as he went on to steal 28 bases in 36 attempts. He has the makings of a five tool player and perhaps the most exciting part is that he will only be 20 for the 2019 season. He will likely start the season in A+ ball and hopefully move his way to AA by the end. He is an electric player that will be extremely solid some day.